Tavare and Murray in a recent NEJM image had an interesting case of hyponatremia correction. The case highlights development of central pontine myelinolysis(CPM) despite slow correction of hyponatremia. 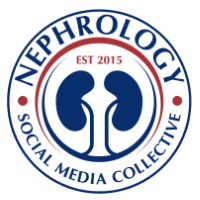 CPM is known to occur in alcoholism, liver disease and malnourishment in the absence of hyponatremia, hypokalemia or hypophosphatemia. We wanted to suggest an algorithm that can be used in settings where alcoholics present with moderate to severe hyponatremia with similar symptoms as presented in this case and are at risk of CPM. The figure below is a novel algorithm that uses brain imaging to help us guide the therapy for moderate to severe hyponatremia in alcoholics. If the patient is symptomatic with seizures, the correction of hyponatremia should be promptly started. If the patient is asymptomatic or with milder symptoms and is encephalopathic ( with several confounding etiologies : hyponatremia, alcoholism, liver disease), a MRI of the brain should be performed. If the MRI confirms cerebral edema, hyponatremia should be treated with the usual slow rate of correction of 6-9mmol/L per 24 hours. 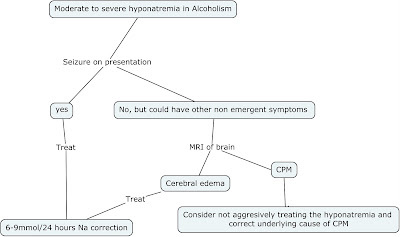 If the MRI confirms CPM, the correction of hyponatremia should be put on hold. We hypothesize that often the hyponatremia in alcoholics is chronic and correction, regardless of the rate, might cause harm in these patients. We welcome comments from experts on this concept. 3. Instead of having an MRI brain showing CPM which in some cases does not appear abnormal after weeks of symptom onset, it would be better to say MRI brain without edema and then correct slowly. Thanks for sharing this cute extra step, but I think rates as high as 6 to 9 mmol/L/day is on the high side for the 2nd step. As recommended by experts, we tend to adhere to the upper limit for the PNa to 4 mmol/hr if the first 6 to 9 mmol/L left the patient with cerebral edema would be my preference but you might want another MRI after the second cycle and this iteration may help minimize the risk of developing ODS and depending on the result decide to treat other causes.